This is Saturday, and my day is chock full of plenty of nothing. But plenty of nothing includes plenty of someone.....someone being JJ. Do you remember The Baron? My sweet Uncle Jack? Well, let me introduce you to his brother. 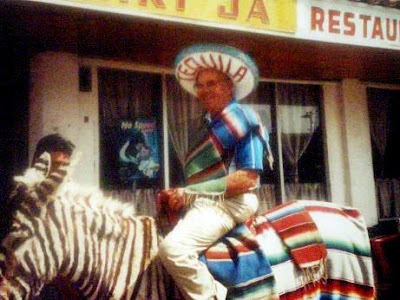 His older brother, Ed...sitting on a jackass in Tijuana, Mexico. Not just any jackass...a jackass with purple stripes. Oh, one more Family Fact.......Uncle Ed is Grandma J's Godfather. Ha! I think I have a picture by that "zebra" too! In fact it was our Xmas card a few years back! I love the old photos...and can't wait to hear more about Uncle Ed! Was Uncle Ed also a Jackass? That donkey has been around forever! I haven't been to TJ in several years, but there are tons of them right there on Avenida Revolucion. I read somewhere that they use shoe polish to make them look like zebras. Of course you know I love Jack. So I have to just die when I see the picture. Now you're introducing ANOTHER new family member who wears a sombrero labeled TEQUILA. Rita, Mr. Bear, good heavens, I am beside myself with Grandma J's cast of characters! Need more stories about Uncle Ed.